It was once the the place where the music blazed out into the night from piano players, guitar pickers, drummers, and vocals arriving by way of Highway 67. Johnny Cash, Carl Perkins, and Conway Twitty were just a few of the names to become legends that would perform in the early days of the Texarkana Arkansas Municipal Auditorium. Perhaps the most famous performer of them all was Elvis Presley, the boy who would become the King of Rock and Roll. But, all those greats faded away from the Texarkana spotlight over forty-five years ago. For Texarkana, the Interstate arrived, planes began to carry the performers from city-to-city and Texarkana’s small auditorium simply would not accommodate the growing crowds of fans. The days when Cash, Presley, and others would drive into town, fill up with gas, perform and then spend the evening on Broad Street in Texarkana faded long ago. The performers that made the auditorium simply outgrew downtown Texarkana. Over the years the auditorium would close, and fade into history between city hall and the fire station. 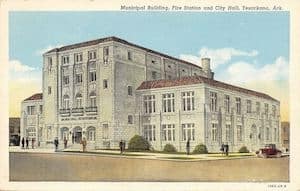 Many people have commented that they did not even know there was an auditorium there, and they simply called the place “City Hall.” Other people have said they heard of an auditorium being there, but that now it was a city office building. In a few nights, the view of the building between the city hall and fire station will change dramatically for the world. At midnight on Saturday, March 2, 2019, the Arkansas Municipal Auditorium will come alive again! Texarkana, Arkansas’ own composer John Tennison (Arkansas High Class 1986) is set to present his entire 36 movement Texarkanon Symphony. The event is free and open to the public. It will also be live-streamed on John Tennison’s Facebook Page as well. Donations will be accepted with 100% of anything donated going directly to the Arkansas Municipal Auditorium Commission. The Commission is a non-profit organization that has works to restore the auditorium for Texarkana, Arkansas. On March 2, 2019, consider joining Texarkana and being a part of history as life returns to the Arkansas Municipal Auditorium. Together, our community can make sure that forty years from now, people everywhere will still talking about the night the stage came to life again in Texarkana, Arkansas. Little Rock, AR- The 21 Arkansas Republican Women Legislators announced that they have officially formed the Arkansas Republican Women’s Legislative Caucus (RWLC). Members of the RWLC will focus their efforts on a legislative package which contains ‘Bold Initiatives for the Good of Arkansas, as part of their ‘Dream B.I.G. Arkansas’ campaign.